Few things let us see the personality of a woodworker like a view into their shop. The design, use and upkeep of a shop gives an odd insight to how a person approaches their work. 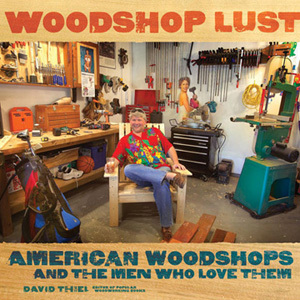 Providing a unique and personal view into the variety of shops found around the United States is “Woodshop Lust”. The book is split up into three sections, the garage based shop, the basement shops, and the stand alone buildings. For all the commonalities in the tools we all use, clamps, drills, saws, “Woodshop Lust” displays a wide variety in how we outfit our work area, from the meticulous organization of Walt Grannen’s in Wisconsin to the more chaotic but still efficient shop of Jim Stack of Ohio, and from the rustic and industrial, to Ray Merrell’s adobe inspired domed Colorado shop. “Woodshop Lust” also covers some of the creations that come out of these shops. Some leaning more to the artistic, others more utilitarian, it’s fun to see how the work reflects these personalities along with the spaces that spawned them. Whether your shop displays sports memorabilia or old road signs or is a stark monument to efficency, editor David Thiel invites readers to send in pictures of their own shops, with a promise of further volumes of “Woodshop Lust” to come. “Woodshop Lust” is available to buy at Highland Woodworking. Building my own Windsor Chair Down to Earth Woodworker – Now on Video!